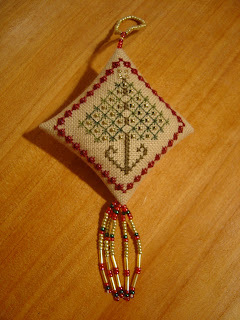 I'm not sure if this is my July or August ornament but it's another one for the finished pile. I just did a quick count of my ornaments for this year & I've done 11 already! Maybe I should stop??? I know I said it last month, but I really mean it this time. 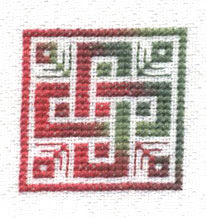 This motif (#9) is my favorite one of the Rosewood Manor Red Threads I've stitched so far. I keep looking at it and concluding that it's perfect--how in the world did I manage that with this multi-color silk? I'm thinking that I'll keep these ornies for myself so I'd best stitch something else next month. Of course, since I've started plotting which motif is next, I don't know that I'll be able to resist stitching another one for August. 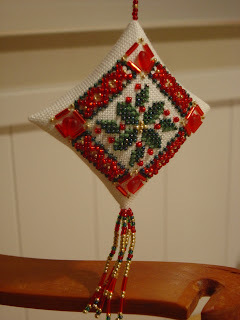 I'm still using the same 28 count opal fabric and Waterlilies Holiday fiber as in the other motifs. I need to catch up 2 ornies, time flies! 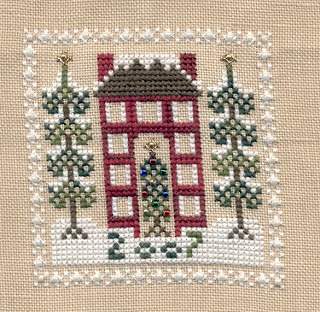 This isn't the first the first appearance for this as Anita stitched it back in April - the archive is great to look back on for inspiration! I made a few changes in that most of my birds are singing and I thought the snow would look better in beads. I'm planning to finish this as a little bellpull. This is from the 2004 JCS Christmas Ornaments. It is stitched on 32 ctr. Vintage Linen with the called for Crescent Color threads. 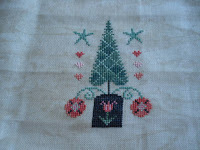 OK, it took a while, but it is stitched. Just a reminder that this weekend is our first finishing weekend! 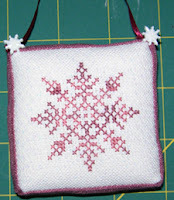 Dig out those pieces of stitching and turn them into ornaments! We will be finishing along with the Focus on Finishing blog. Please pop over and have a look - there are some great tips on there for finishing ideas. As an added incentive, there will be a draw with a prize! Everyone who finishes an ornament that weekend and posts it to the Finishing blog (not here) will be entered into a draw for some Christmas finishing supplies. I hope you'll all have fun! 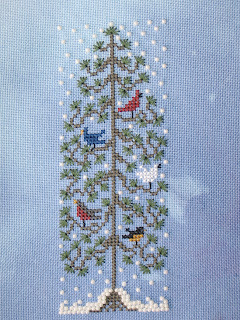 Kitted up for sale (with everything but the chart) at the Rockome National Counted Cross Stitch Show last month by Stitcher's Express (Mattoon IL), this ornament was a must have after you saw the finished one on the counter. 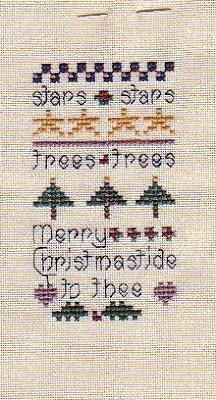 For me this was not a snap to stitch and finish, but once you get it laid out and put a few stitches in on each side as your guide, you don't need your pattern or to think very hard until it comes time for the words to be added. I modified mine from "Cookies for Mr. C" to "Cookies for Santa". Once you have those gingerbread men on it and have it all put together, you can't stop thinking about baking some real gingerbread men.....well, maybe not in this heat! 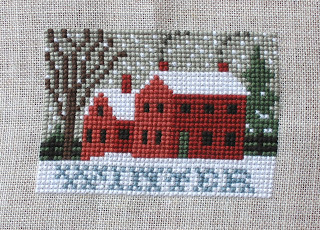 This is a freebie by the Drawn Thread, Home for the Holidays. I think I'll finish it into a small tuck pillow with a little hanger.